Have these two men been finger printed & profiled against the robberies that have taken place in windsor park? and don't forget it was reported that a large haul of ganja was found in that area too my guess is if it wasn't these two they probably know something. I think the parents of the 16 year old should be hauled into social services and give an account of why their son is roaming the streets at 3:30 in the morning. This is just puzzling to know that a sixteen year old boy is out of his residencey that time of the morning – What has happen to his parent(s)??? In situations like this we being to wonder where are the parents of the minor?? Having grown up in a crime free relatively gun free Cayman every gun retrieved is good news. It saddens many though that the public is NOT reporting more illegal guns. We all knew where the bad guys were and it is the same today. There are ordinary people out there that know where the guns and bad guys live. These bad folks are destroying your country, don't protect them. I continue to be disappointed in the leadership and their ridiculous stand that the police and The Governor are in charge of crime. This finger pointing is wasting time and good people are getting robbed and hurt as crime takes over the country. Let the citizens have their rights, not taken away by the Commissioner of Police. When the citizens protect themselves the police would have more time to deal with other crimes. I believe in helping myself before asking for outside help. Try it, tried and true. We need to be given the names and adresses of these people who get caught with guns so that we as a community can keep eyes on them and their families and associates. We must keep unrelenting pressure on these people until they give up and go and get jobs. Trust me there is one in every family I am sure if you look hard enough you might find one in your own, now ask yourself would you want your family penalized because of one good- for- nothing family member? and by the way they are no family of mine. With that being said good job RCIPS , keep up the good work. Wake up until you outgrow that keep the family secrets mentality these criminals will continue to hide from justice. My point is this ; If you are a law abiding citizen and so is the rest of your family but you have say a brother or sister who partakes in criminal behaviours, would you want the police or even your neighbors stationed at your door watching with accusing eyes as you and your law abiding family go about your regular lives? If you are honest with yourself your answer should be NO !!! If you are doing no wrong why should you be the one to suffer for it . People lets not forget come November all of you will be singing a different tune …bout una want people address to go harass um…… !!! "now ask yourself would you want your family penalized because of one good- for- nothing family member?" That comment says it all. Have you ever heard the saying if you fail to deal with the problem you are part of the problem? (or something along those lines). And yes, I would report them, because they and their families are all guilty of playing a part in the current destruction of these islands. A good for nothing family member should not be encouraged, by allowing him/her to be housed and feed. Any child 16 years old should be in his bed and not on the street. What part is Children and Family Services playing in this type of situation? Are they here? I agree, Mr Haranguer. We should keep pressure on these gun-toting outlaws, And so should LAW ENFOCEMENT AND THE COURTS, until they give it up or GET OUT OF THE CAYMANS! Where is the CAYMANS? This is the Cayman Islands. NOT the Caymans. Get it right. The Caymans is a perfectly accurate geographical terms for the group of islands comprising of Grand Cayman and the Lesser Caymans. The US police is developing an infrared device, a body scanner to dectect guns in the street. this will cut out the time to frisk suspects. The device will be mounted on top police vehicles. It is about time the rcip do their job, I hope they seal the deal with these thugs! Good job guys! This should be a normal occurrence with early morning raids on suspects and keep those thugs on there toes. Thank you RCIP another gun off the streets. 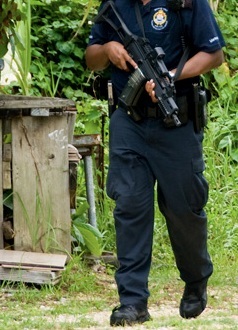 To the Cayman community I say help the police get all of these guns off the streets. Talk to your children, they know much. School children know every thing, talk to them. Let them know the dangers of guns. Remember your grand childs life could be saved. Do not hesitate to tell the police about guns. Re: "Let them know the dangers of guns." There is not hate like gun hate! There is not enough gun hate. There are too many NRA influenced gun lovers on these boards. Thank goodness the police have won their legal battles against these people. Arrest these little fries all you want (as you should), but the only way to cut off the head of the snake is to arrest some of dem big boy politicos and their criminal associates. The first to be charged under the new anti-corruption law is a receptionist…don't know how, but they have somehow missed all the other big piles of elephant sh1t that are stinking up this place. Au revoir. Thank you for your perceptive and helpful comments on elephant excrement, Beaver. Since you apparently know who "dem big boy politicos and their criminal associates" are and presumably you have the sort of evidence/proof that would stand up in court, could you please pass your information over to the RCIPS? Thanks. Right Sherlock. You're obviously far beyond my intelligence level. Nothing amiss here whatsoever. Nothing but blue sky, purple rainbows, pots of gold, and harp-playing angels. So best of luck compadre; make sure you don't trip all over your own shoes. On a more serious note… What I have stated is true. They use this new law to haul a receptionist in front of the courts when there are much bigger fish to fry. If you don't know what I'm talking about, you're either a newcomer, a fool, or an idiot. The reason that this evidence and/or proof you speak of does not see the light of day is because there is no political will on these islands to make it appear – corruption is endemic in these parts of the world. There are hundreds of employers/companies who ripped off the pension and medical contributions of their employees, yet only a handful have gone to court. As for corrupt practices, the questionable wheeling and dealing, conflict of interest, and backroom deals that have been conducted recently (and in the past) by influential and prominent members of the community which could be investigated under the new anti-corruption legislation, well…like I said, you're either a newcomer, a fool, or an idiot if you don't know what I'm talking about. P.S. Make sure you don't trip face first into that elephant excrement that I talked about earlier – you seem the type who just might. Ask the status recipients who had been here less than 5 years how and why they got it. Ask the people who have resigned from the port authority and CTC why they did so. Ask the police officers who investigated FCB what their findings and recommendations were. Why should the RCIP be told anything. None are so blind as will not see. What an irresponsible post. I would hope that after making such accusations, you would have the proof, and more importantly the courage to come forward with this. A mouth can say anything when it learns to speak. Your mean like your comment, case in point. It is not my words Beaver! Beaver I don't know what you talking about but if you are implying that politicians in the Cayman Islands are involved with gun-running and criminal gunmen, I think you are mistaken if you believe that either the PPM or the UDP have anything to do with these young gunmen overrunning the Islands. Give them all the names you want but not involvement in crimes. Cayman has not reached that stage and I hope it never will.They might be "cutting at one another's throats" , but have not reach the all time low we see in some countries in the region. They know the value of tourism to the Island and would not recklessly undermine this industry. Sorry, I should have been clearer. What I meant to say is that crime exists at all levels of society, including the upper echelons. Though those in the upper reaches of society may not be running guns and drugs, their corrupt activities are as harmful, if not more harmful, than those of the street criminal. I stick to my earlier point that those who so easily dismiss the talk of corruption among some of the more prominent members of these islands are either willfully blind, ignorant, or plain dumb.